Today’s Gospel almost did not make it into the canon of the Scriptures; it was a cause of consternation to certain Christians of the early Church. The gentle compassion of Jesus seemed excessive to them. His merciful attitude towards the woman caught in adultery seemed too liberal, too easy. In several early manuscripts, the passage was simply deleted from the text. But the mercy of the Lord Jesus is indeed excessive! “His mercies never come to an end, they are new every morning” (Lam 3:22-23). The painting is from Capodimonte, Naples. 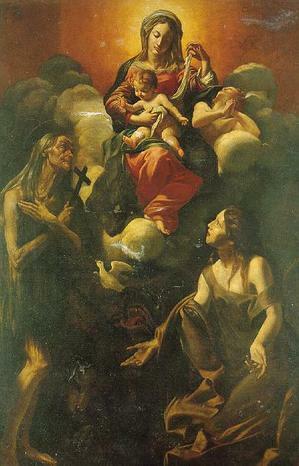 Saint Mary of Egypt is on the left, and Saint Margaret of Cortona is on the right. Our Lord has spent the night in prayer on the Mount of Olives (Jn 8:53). At daybreak, He descends from the Mount of Olives to the Temple precincts. The people come to Him, ordinary people, sinners of all sorts. In contrast to those who come to Jesus in order to hear his word, we see the scribes and Pharisees — the professionals of religion, the rigorists — who seek to entrap him. Their ears are open to catch Him in some theological inaccuracy or in some political faux-pas, but their hearts are closed to His excessive mercy. They bring to Jesus a woman who had been caught in the act of adultery. In spite of their deceptive and twisted motives, in bringing the woman to our Lord, the scribes and pharisees do a good thing. A sinner is brought to the Saviour, a lamb to the Shepherd, one bruised and ailing to the Physician. Out of the evil designs of the scribes and Pharisees, our Lord will bring a great good. There are diverse ways of being brought to Christ. The woman caught in adultery is the captive of the scribes and Pharisees; she will become the captive of Divine Mercy. Accustomed to being used by men, she will be used by them in their experiment with Jesus. She is the bait with which they will attempt to catch Jesus, and she is a well-chosen bait, because the mercy of Jesus is irresistibly attracted to the misery of sinners. She is humiliated. She is fearful. She is ashamed. She is forced to come into the presence of Jesus; she is pushed into His presence. At times something very similar may happen in our own lives. We are dragged into the presence of Jesus as a result of circumstances that humiliate and terrify us: disappointment, betrayal, illness, failure, the loss of a loved one, or the jealousy, the rigorism, or the lust for power of another. At other times, it is Jesus himself who seeks us out. He comes to us, like the shepherd in the wilderness. He comes in search of the lost sheep. “And when He has found it, He lays it on his shoulders, rejoicing” (Lk 15:4-5). At still other moments in our lives, the decision to seek out the Lord Jesus Christ is our own. Wounded by the Word of God, pierced through by repentance, the Holy Spirit sets our feet on the path of return to Christ, that through Christ we may return to the loving embrace of the Father. This is the case of Saint Mary of Egypt, the notorious prostitute of Alexandria, celebrated in the Eastern Churches as the supreme model of Lenten repentance and of resurrection. So impressed was Abbot de Rancé by Saint Mary of Egypt, that he had her feastday inscribed in the calendar of La Grande Trappe. You know her story. She was a glamorous harlot, a spectacularly public sinner, practising her profession in the great city of Alexandria. 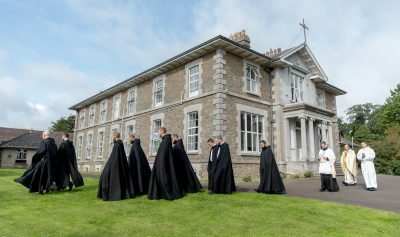 Hearing of a pilgrimage to Jerusalem for the feast of the Exaltation of the Precious and Life-Giving Cross, she boarded ship with the pilgrims, seducing them at sea, indulging in shameless debauchery, partying long and hard all the way to Jerusalem. Years later, Mary was discovered by Father Zosimas, a monk of Palestine who had gone into the desert for the forty-day fast, according to the custom of his monastery. Her story has been told again and again, giving hope to all who are weak, to all who struggle, to all who seek to cross over — out of sin — into the pure joy of the Holy and Life-Giving Cross. The life of Saint Mary of Egypt is, in its own way, a homily on today’s Gospel. Let us return that Gospel: in it the details of Jesus’ behaviour are of the greatest importance. They are sacramental details; they reveal the thoughts of Jesus’ Heart. First, Jesus refuses to look at the woman caught in adultery. He deliberately remains bent down, crouched close to the ground, tracing letters in the dust. Jesus has no need of seeing the woman’s face in order to probe the depths of her soul. By bending down, close to the ground, Jesus identifies Himself with her and with all who are downtrodden and despised. The words of the psalmist come to mind: “My soul lies in the dust; by your word revive me” (Ps 118:25). Jesus refuses to look at the woman, lest he add in any way to the crushing weight of her shame and guilt. Without fixing his gaze upon her, He is with her in her humiliation and anguish. When Jesus addresses himself to the scribes and Pharisees, however, the Gospel account makes a point of noting that He stood up. “And as they continued to ask him, he stood up” (Jn 8:7). Jesus stands to pronounce judgment. He stands to speak with authority. He stands to defend the sinner against the accusations of the self-righteous. The psalm says: “Thou, Thou alone strikest terror. Who shall stand when Thy anger is roused? Thou didst utter Thy sentence from the heavens; the earth in terror was still when God arose to judge, to save the humble of the earth” (Ps 75:8 10). Looking at the woman’s accusers, Jesus says to them, “Let him who is without sin among you be the first to throw a stone at her” (Jn 8:7). These words are the echo of his teaching in the Sermon on the Mount: “Why do you see the speck in your brother’s eye, but do not notice the log that is in your own eye? Or how can you say to your brother, ‘Let me take the speck out of your eye when there is a log in your own eye?” (Mt 7:3-4). Having spoken to the accusers, Jesus again bends down and continues to trace letters in the sand. He has nothing further to say to them. One by one, they go away, leaving Jesus alone with the woman. 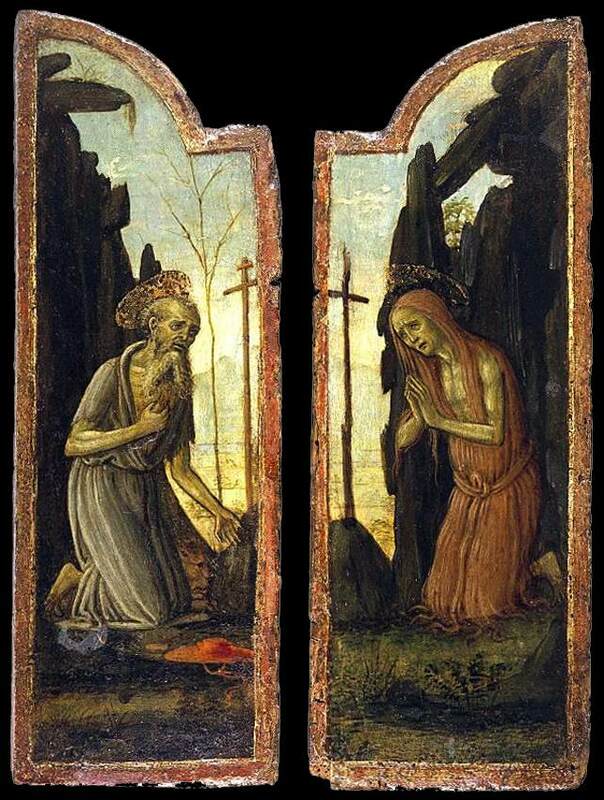 Saint Augustine says that, “great misery is left in the presence of great mercy.” The Gospel makes a point of noting that now Jesus is bent down while the woman is standing. A resurrection has taken place! By lowering himself, Jesus “raises up those who are bowed down” (Ps 145:8). According to the Gospel, the woman has said nothing to Jesus up to this point. Nonetheless, the cry of her heart reached the Heart of Jesus. His mercy was moved by her misery. Then he looks up to speak to her. Jesus here is kneeling; the woman is standing. The humility of the Divine Mercy kneeling before sinners, pleading to be accepted! He who gives mercy and forgives sin makes Himself lower than the one who stands in need of mercy and forgiveness. O wonderful condescension! “Woman, where are they? Has no one condemned thee? No one, sir, she replied. Neither do I condemn thee, said Jesus, go, and do not sin again” (Jn 8:10-11). This is the Communion Antiphon of today’s Mass. Is there any harshness in the words of Jesus, any condemnation? Is there anything cutting, humiliating or belittling? There is nothing but gentleness –gentleness, and an excessive mercy. There is no need for us to live with the ghosts of the past, with the memory of past sins and troubles weighing heavily upon our hearts and preventing us from moving forward. If we have been brought to Jesus Christ by the circumstances of life; if, by God’s grace, we have come to Jesus Christ; if Jesus Christ Himself has sought us out, placed us upon His shoulders and carried us home, then “there is no need to recall the past, no need to think about what was done before” (Is 43:18). The excessive mercy of the Lord has swallowed up all our sins, leaving no trace of what was, and filling the present with the sound of his praise. “The people I have formed for myself will sing my praises” (Is 43:21. Praise is the characteristic mark of one who has tasted the sweetness of the Lord and known his excessive mercy. Adoration is fruit of every encounter with the Holy Face of Christ. The Church is an assembly of sinners who have read the excessive mercy of the Heart of Christ on His Holy Face and, as a result, cannot stop singing, and cannot cease from adoring! “Forget the past, then, and strain ahead for what is still to come” (Phil 3:13), the great and glorious Pasch of our Lord Jesus Christ. Thank you once again, Father! Utterly overwhelming!